If you use chat (IRC or Instant messaging), clear your log files. I strongly recommend closing your applications before removing any log files!! After constantly installing and removing software, some leftover information might be just clogging your disk space for no apparent reason. The apt-based package management has two commands when you remove packages: remove and purge. The difference is that purge actually deletes the configuration files that are deliberately left there when you used remove, in case you want to install it again. Another way to find these out it to head to System → Administration → Synaptic Package Manager → Click "Status" (lower left corner) → Select "Not Installed (residual config)"
Now in the package list, right-click on the package that you wish to completely remove (aka purge) and select "Mark for Complete Removal". Then you press "Apply" and let it flow. Tip: Press SHIFT+A to select them all. d) To remove obsolete packages go to System → Administration → Synaptic Package Manager → Click "Status" → Installed (local or obsolete) → Mark the packages you wished to be completely removed (or preferably removed). Warning: These section includes packages that have been manually installed by third-party packages (not from ubuntu repositories), if you need them, don't remove them! 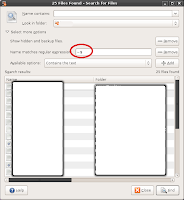 Clear the temporary files created with gedit - to do this, you have to search for them. Go to menu Places → Search → Click "Select more options". Now select "Show hidden and backup files" and click "Add". Also add the "Name matches regular expression". Next to this last one you will type ~$, which will find all filenames that end with "~" character and most of them are temporarily created by gedit (gnome's text editor). Press "Find". Now you can select the files you want to delete and right-click → Move to trash. Warning: Some files are temporary application files that are deleted when you end the application. It might be best not to mess around a lot with this one.